Based on their recent form the Brisbane Heat are expected to cruise into the final ahead of Sydney Thunder. 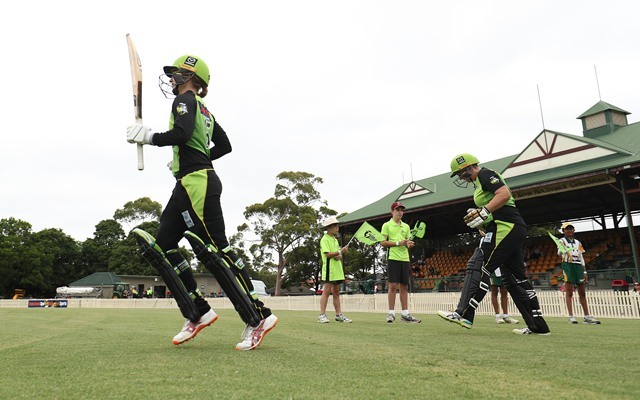 The knockout phase of the Women’s Big Bash League 2018-19 will kick start with the Sydney Thunder facing Brisbane Heat at the Drummoyne Oval. Thunder finished at No.3 in the points table ahead of the Brisbane team as they had an extra point due to the washed out fixture against the Melbourne Stars. The Alex Blackwell-led team will miss the services of Harmanpreet Kaur as the Indian T20I skipper will join her team for the New Zealand tour. The Brisbane Heat don’t have much to be bothered about the team as they have continued to retain the same set of players for almost every game this season. They will come into this game with confidence having defeated Thunder in the last league match. Chasing a target of 172, opener Beth Mooney made a 55-ball 102. Despite the fact that, no other batter could cross the 20-run mark, the Brisbane team clinched the game by a 3-wicket margin. 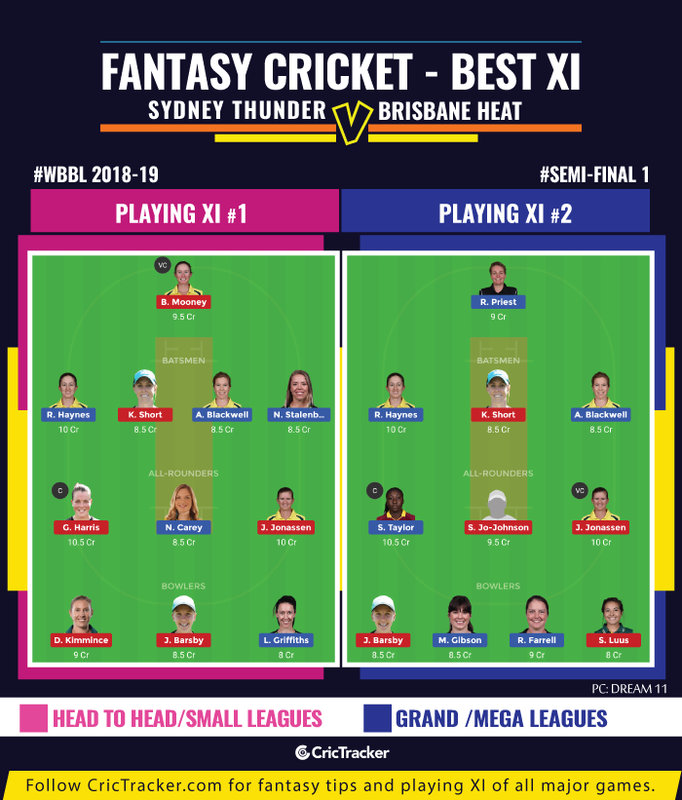 The first semi-final match of the Women’s Big Bash League (WBBL) will be played between Sydney Thunder and Brisbane Heat at the Drummoyne Oval in Sydney. The match starts at 10:40 AM local time (11:40 PM GMT – Previous Day) (5:10 AM IST). The Drummoyne Oval has quite an interesting WBBL record as the venue reflects scores of 101, 88 and 83 in the three matches it hosted. In the four Women’s T20 games this venue hosted until the end of 2013, the average first innings score read 124. In fact, the recent List A matches hosted here indicate better results. Three of the last five completed matches were a witness to 300+ totals. The teams batting second have scored at better than run a ball in all those five matches. Alex Blackwell (C), Rachael Haynes, Rachel Priest, Naomi Stalenberg, Stafanie Taylor, Nicola Carey, Rene Farrell, Rachel Trenaman, Maisy Gibson, Lisa Griffith, Sam Bates. Kirby Short (C), Jemma Barsby, Josie Dooley, Grace Harris, Laura Harris, Sammy-Jo Johnson, Jess Jonassen, Delissa Kimmince, Sune Luus, Beth Mooney, Laura Wolvaardt. Alex Blackwell may not have been as effective as she was in the WBBL since her retirement from International cricket. However, the last two matches instil confidence that she will make up for the absence of a vital cog in Harmanpreet. Blackwell made a 23-ball 28 in the previous match against the Heat and an unbeaten 48-ball 66 against the Melbourne Renegades in the preceding match. Any two players picked from the all-rounders category (Stafanie Taylor, Grace Harris, Nicola Carey, Sammy Jo-Johnson, Jess Jonassen) can also be your captain and vice-captain. Beth Mooney and Rachael Haynes are worthy of multiplier preference from other categories. Stafanie Taylor, Grace Harris, Nicola Carey, Sammy Jo-Johnson and Jess Jonassen in the all-rounders category contribute to a selection headache. A maximum of three among the five can be a part of your team. Carey, Harris and Jonassen will be perfect picks given their recent performances, credit allotment and their chances of creating an impact in the game.